This week's Intuitive Tuesday card was the Ten of Wands (reversed), which is about releasing burdens and preparing for upcoming changes in your life. I got this same message a wee bit earlier this evening before I read your blog... It came to me in a different way of course but the message was the same none-the-less. "The reversed Ten of Wands may also indicate that you have been preparing for some changes in your life, possibly subconsciously, and are getting ready to more fully commit to your new direction." The follow-up card I pulled today is from my new tarot deck (I got it! I got it! ), the Legacy of the Divine Tarot by Ciro Marchetti. This is the same artist who created the Gilded Tarot deck and these cards are beautiful! The card I pulled in response to Suzi's comment is the Queen of Cups. If I were to hand-select a card from the deck to describe you, Suzi, this would be the card (the High Priestess would be a close second). The Queen of Cups is a highly intuitive, sensitive, nurturing woman who is comfortable with emotions -- both her own and others. She is the type of woman who could mother just about anyone...and does. 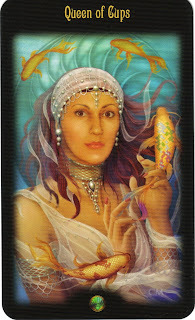 The Queen of Cups has a huge heart, is loving, caring empathic and intuitive. Suzi, for you, this symbolizes not what will happen in your life, but how you approach it. You pulled a quote from the Intuitive Tuesday post about upcoming changes in your life and fully committing to your new direction. The approach you take this year is not new to you, but more intense and more consistent. This year your intuitive gifts will be very present in your every day life. In the past you may have tapped into your intuition after trying several other approaches to make a decision or face a situation. This year your intuition will be front and center. You intuition will be your first choice for how to approach...anything. For all of us...use the message of today's card, the Queen of Cups, as a reminder to you to tap into your intuition every day...all of the time. If it seems awkward at first, remain persistent. Keep tapping in, get a gut feel...and then go from there. Remember the Ring of Truth exercise I talked about in a previous post? This is a great time to use this skill, at least until you begin to trust your intuition immediately. If it's easier, pretend that you have a brand new pair of glasses that have an "intuition" filter or tint. When you put these glasses on, you see the world from an intuitive perspective. Situations in your life are filtered through your intuitive gifts before they enter your brain. So your brain is processing your intuitive hits about the situation instead of the details of what's happening in front of you. As you get used to your new "intuitive" glasses, imagine that they turn into contact lenses and then are incorporated into your system through Lasik surgery. This is when your intuitive filter becomes part of who you are and how you see the world. Every day. All the time. Get it? So...once you put on your intuitive glasses, let me know how things look from this perspective! I see how the 10Wands, Reversed, is well-matched with the Queen of Cups. (You know, on this card she reminds me of your little sister). (This IS a beautiful rendition, too). I just lived a Queen of Cups experience, and part of that was laying down some burdens of the old way. Love this card! It came up as the future card in the 2010 reading you gave me yesterday, Sheri. And I just sent out an Intuition Exercise to a few people interested in advanced classes I am planning. Seems right on to me. Thank you, Sheri. What a great message for Suzi. I'm excited about her upcoming year. And mine, as well. For me, trusting my intuition will also mean not blaming myself so much when things don't seem to go just right. I see the resemblance, too! Both in looks and in energy. I like the analogy of LASIK for intuitive abilities. I am going to meditate on the during my upcoming procedure. Brilliant! Many of the cards leading up to today seem to have been leading toward a loosening, breakthrough, release, or a way to walk away from old burdens and walk into one's new self. The Queen of Cups seems to be telling me how to handle this wonderful new world that has opened up (even if its newness may seem a little frightening). And that "how" is by trusting myself and acting with love, courage and certainty. When we know we are staying true to our paths, it is easier to take actions that are true to ourselves. And you have proven, Sheri, that one who remains true to herself has a magnitude that attracts goodness and love. Thanks for getting us through ... last year and the next. I was so surprised and honoured to see that you chose me to pull another card on! And to be described by you as possessing the characteristic of the Queen of Cups... OMG! She is one of my favourit cards... as is(as you already know)the High Priestess. You are correct in saying that the approach I take this year is not new to me. I have been blessed with intuition all my life, although at times have chosen not to use it... I can already see that my intuition is front and centre this year and for the rest of this lifetime. I have already jumped to use it in several situations and we are only 7 days into the year... As a matter of fact, I was late to a meeting today because I was doing a psy-card reading for someone... Thankfully, everyone understood. I will never tire of your affirmations and guidance as I go through my day to day life adventures... Thank you, Sheri, for being you and the wonderful friend you are to me. You are one of the women who are truly bright lights in the universe and in my life. I am so fortunate to have all of you!